Buganda Kingdom prime minister Charles Peter Mayiga said the raid on Parliament was uncalled for. File photo. 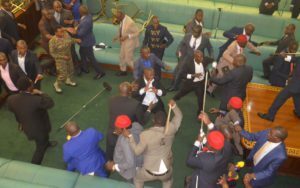 KAMPALA– Mengo government has condemned the manner in which security agents attacked and assaulted legislators on Wednesday. During the Lukiiko meeting convened yesterday, Buganda Kingdom prime minister Charles Peter Mayiga described Wednesday’s event as horrific and unwarranted. 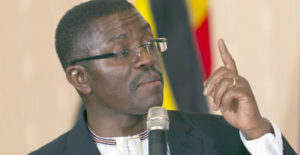 The Katikkiro called for observation of both individual and common rights of the people as the debate on the amendment of the Constitution to lift the Presidential age limits heats up. “We also sympathize with those who were injured and are now admitted in different hospitals,” Mayiga said. The Speaker of Parliament, Rebecca Kadaga, suspended a total of 25 legislators, most of them from the Opposition, over indiscipline. The State minister for Water, Ronald Kibuule, was also suspended for entering Parliament with a gun. When the suspended MPs failed to heed to Kadaga’s directive, security personnel entered the House and forcefully ejected them. The legislators tried to resist and fought off the ‘invaders’ using stands, bare-knuckles and loudspeakers but were overpowered and dragged out of Parliament. Amending Article 102(b) of the Constitution to allow President Museveni run for another term in office has been a contentious issue and has split the public, with some members supporting the amendment while others vehemently oppose the move. Many politicians were this week arrested, detained at different Police stations while others were blocked from leaving their homes. To cool the situation, recently the religious leaders proposed that the matter should be solved through a referendum. The Civil Society Organisations, especially women movement, attacked Speaker Kadaga for failure to handle the issue in a diginified manner. The women movement groups say they are disappointed with the way the Speaker is handling the age limit issue. At the press conference held in Kampala yesterday, the women said Kadaga had promised to handle the issue diligently during a meeting they had with her. “ She would have adjourned the sitting if the 25 MPs had refused to vacate the House instead of inviting the security agents forcefully evict them,” Irene Odida, the chairperson of FIDA Uganda, said.